Start adding products to your system to view their availability, record service history, and add it to opportunities. Products are items that you rent and sell. Create a product here to start managing its availability, record service history, and add it to opportunities to supply it to your customers. This is where you’ll provide the general attributes for the product. Tell the system how you charge for the product. Add the physical units of the kit – how many do you have to rent or sell? In this guide, we’ll walk through step one. Adding rates and stock levels have their own guides. To create a product, go to your main products screen and click the green add product button at the top-right. You’ll see the “Create Product” screen. The name of the product. This will appear throughout the system: when, searching for the product to add to an opportunity, on customer paperwork, on reports, and in the main products list. 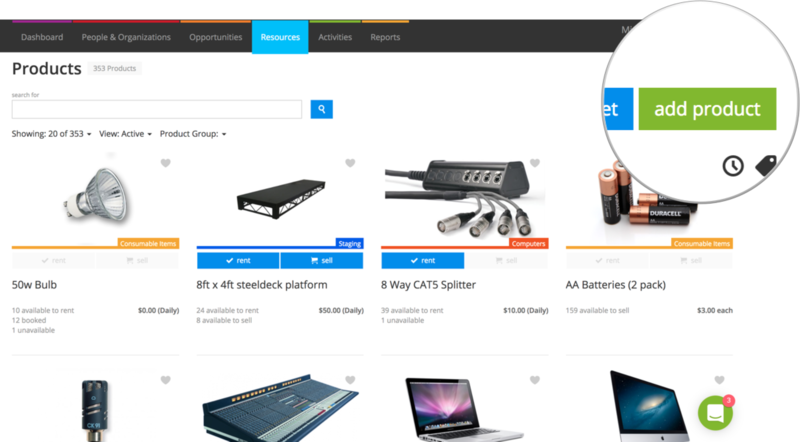 Great for searching and sorting, describe the product with tags here. Hit enter to turn tags blue and lock them in. Choose a product picture here. Some of the quotation layouts include product pictures so you can show your customer what they’re getting. Enter a few words to describe the product here. By default, this is internal-only, but your document layouts can be modified to include the product description. Most of these fields should have values pre-selected and you might find that you’re happy with the defaults. Here’s a quick run-through of what they mean. 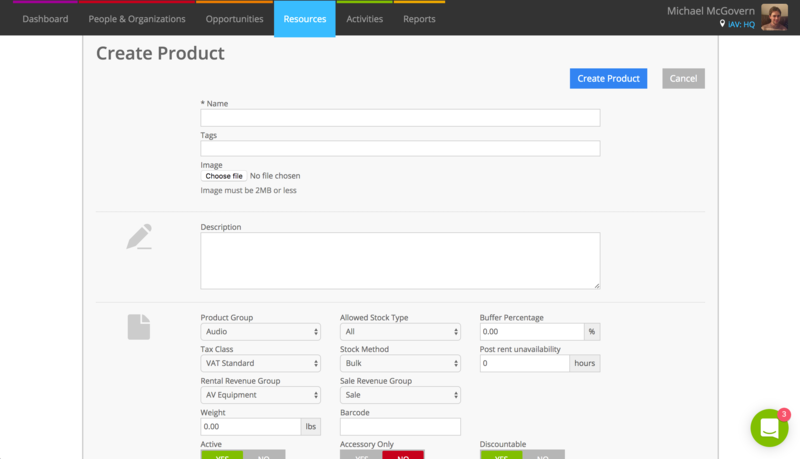 Categorize your products into product groups. Choose from an existing group in the list or add a new one by choosing (create a group). There’s only one level of product group in Current RMS. Use tags for further categorization. Choose rental if you rent the product, sale if it's something you sell, or all if you both rent or sell it. How do you want to keep track of the stock of this product? For simple stock tracking, choose bulk. You can enter a bulk stock level and Current will keep track of how many you have available. For example, you have 100x HDMI cables. For more advanced asset tracking, choose serialized. You can add a list of assets that you rent or sell to the system and Current will keep track of how many you have available. For example, you have 10x ETC Source Four lamps with unique asset numbers. For no stock tracking whatsoever, choose non-stock. You don’t need to add a stock level and Current doesn’t do any stock tracking. This is perfect for nominal products or creating package products. The “Rental Revenue Group” and “Sale Revenue Group” fields are used when integrating Current RMS with an accounting solution. Revenue groups are mapped to your accounts package. Select a revenue group for each transaction type here. Set up new revenue groups in System Setup > Revenue Groups. How do you charge tax for this product? Tax classes are used with tax rates and rules in order to calculate tax. Choose a tax class here. At what point do you consider the stock to be low? For example, if you set this to 50%, when half of your stock is unavailable then you'll see orange warning tiles in the availability screen. When checked-in, should the product be unavailable for any additional time? For example, if the product needs to be cleaned, you might set 1 day here to give you a chance to turn it around. The weight of one unit. For bulk and non-stock products only, set a barcode that you can scan for this overall product. For example, you might stick this barcode to the box where you keep this product and scan it when you pull a product from the box. Generally, you’ll want to set this to YES. When you no longer rent or sell a product, set it as not active to hide it in the default views and prevent you from adding it to opportunities. If this product is only ever rented or sold as an accessory to something else, choose YES here. The product won’t show up when searching to add items to an opportunity. Prevent this product from being discounted on opportunities by toggling this slider to NO. What’s the value or how much does it cost to replace this item? You’ll see this on some reports and on the standard Rental Agreement document. Surcharges are a way of automatically adding a percentage-based or fixed-fee charge to rental products added for an opportunity. Set them up in System Setup, then turn them on for this product here. Add some other products that are similar to this one that would be a good alternative to this one. This is just for your reference. For rental products, set a sub-rental cost group, price, and rate definition. For sale products, set a purchase cost group and price. Your options here are determined by the “Allowed Stock Type” set against your product. The sub-rental and purchase costs are used here when no specific supplier cost is found against this product that matches the supplier you set against a sub-rental on an opportunity.